Literally understood, aperitivo should mean casual light meal accompanied with alcoholic drink. Usually when you come to any aperitivo bar, they will offer you some light snacks to accompany the beverage you buy as what you can see in the photo. Aperitivo is usually started before dinner time for appetizers. The idea is to have a casual hangout with friends, just to taste some great cocktails with some food offers at the bar while chitchatting with friends. This concept is very popular in Italy and the name derives from the word aperitif, which means alcoholic drinks. Aperitivo is its Italian name. However, no matter it’s originally a hangout activity to enjoy some alcoholic beverage and some snacks, Italians have other creativity in their mind. 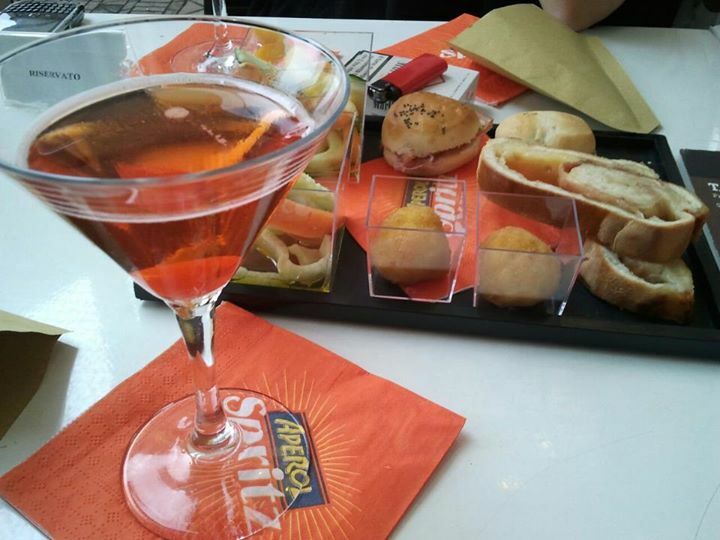 Aperitivo in Italy doesn’t only mean some drink with some food. Instead, they have developed the concept into something a lot bigger that makes the term aperitivo become very well-known in the country or for foreigners staying in Italy. This term means well, in its literal meaning, the hours during which you’ll be happy. This is their nickname for Italian aperitivo. Why? It is because usually they set some time for these happy hours in one day. It’s not done for the whole 24 hours but only for some hours during the day. To refer to the original meaning, pre-dinner drinks and snacks, happy hour aperitivo in Italy is usually done from 5 p.m to six p.m. until 9 p.m to 11 p.m. Why is the duration so long even until after dinner time? Yes this is the main attraction of aperitivo in Italy, “You buy our beverage, we pay your dinner”. Some aperitivo places in Italy offer the original concept with a drink and some snacks like the one where I took the photo above. BUT, a lot of others offer and prepare you absolute dinner menu if you buy the drink there. You pay the drink, the buffet is yours. Usually one glass of cocktail during aperitivo hours is between €7 to €10, which depends on the city and places. The dinner menu they offer is also usually various from one place to another. However, the idea is similar and at the good aperitivo bars, they will give you complete menu from appetizers like salad, first course, second course to desserts. And these are all free, the most important is you buy their drinks and beverages. Some aperitivo bars also offer you cheaper price for the second drink you buy (if you add another drink) but some don’t as they will still charge you the same price you pay for the first drink. Some aperitivo places also provide you with quite salty dishes as their tricks to make you get thirsty and finish your drink so you will buy another. But some others are honest and their food are good and decent.